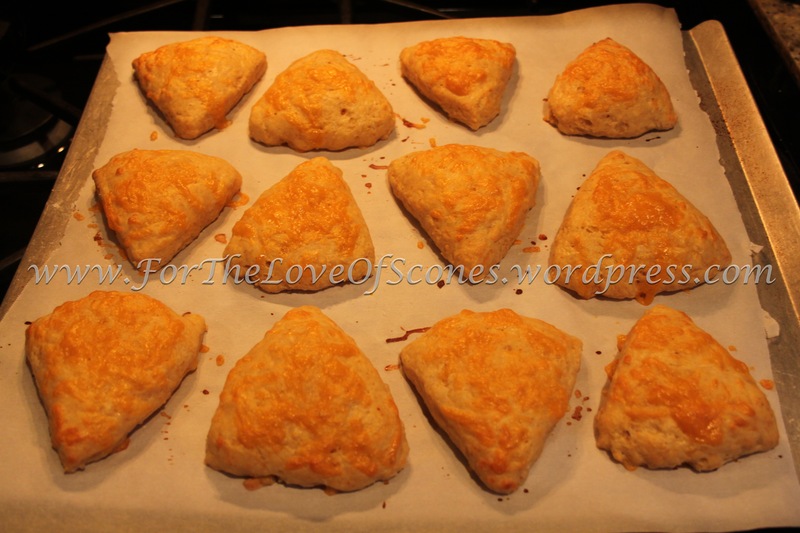 I find that savory scones are always great for breakfast or an afternoon snack. It’s a nice change from the sweet scones which can often be overpowering in their sweetness early in the morning. 1) Preheat the oven to 400°F. 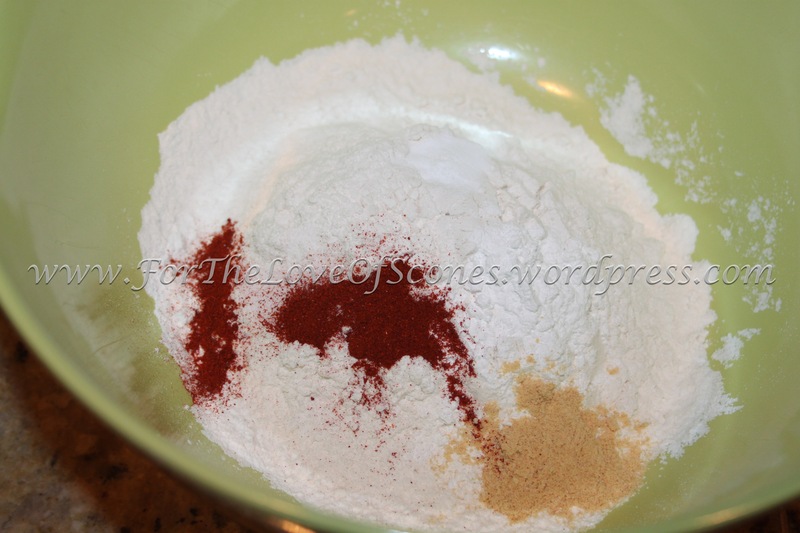 Combine the dry ingredients: flour, cream of tartar, baking soda, dry mustard, paprika, and salt. Whisk to mix. 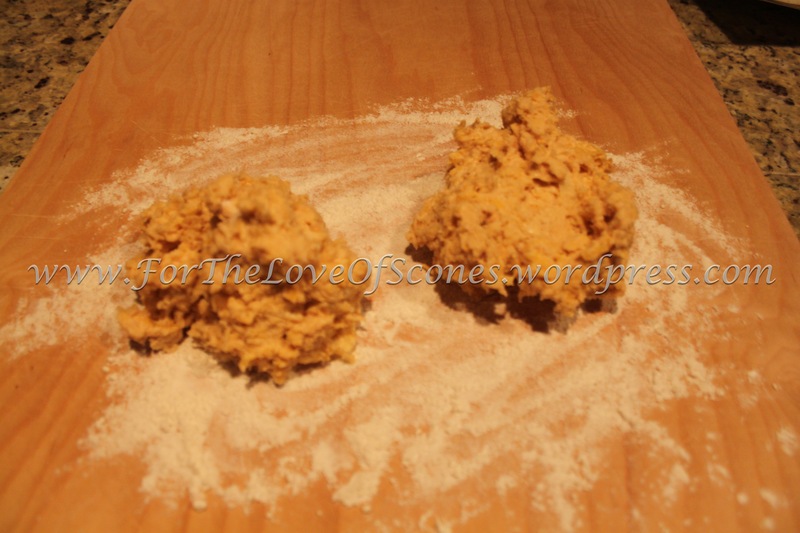 2) Add the butter and work in with your fingertips (or a pastry blender) until the mixture resembles fine granules. 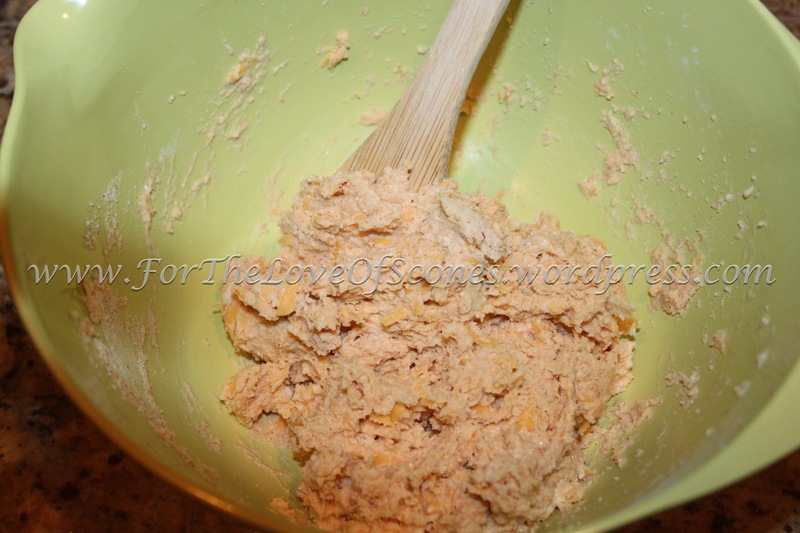 3) Add cheeses and toss with a wooden spoon to mix. Break up any clumps of cheese. 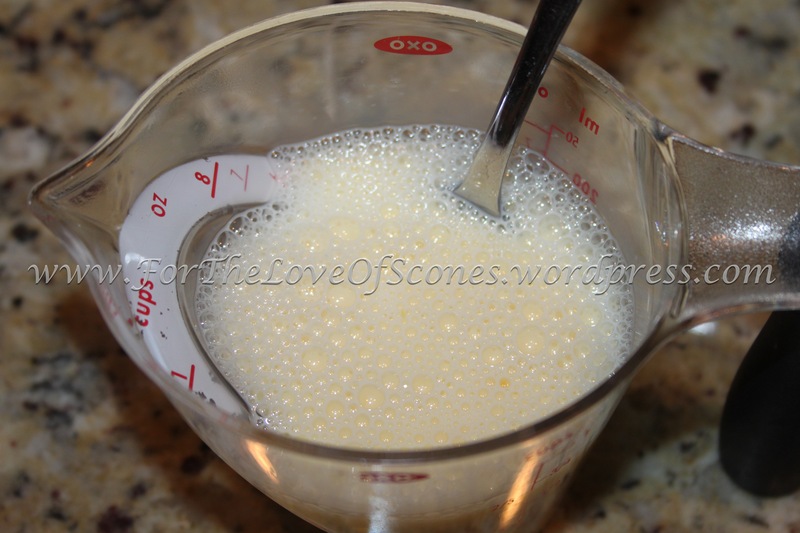 4) In a small bowl or measuring cup, add the egg to the milk and mix with a fork until homogenized. 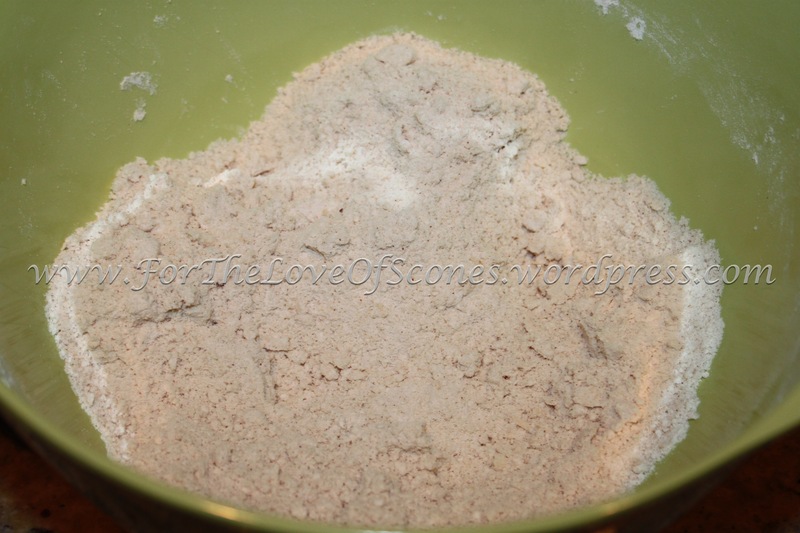 5) Add the liquid to the dry mixture and stir with a wooden spoon to combine. 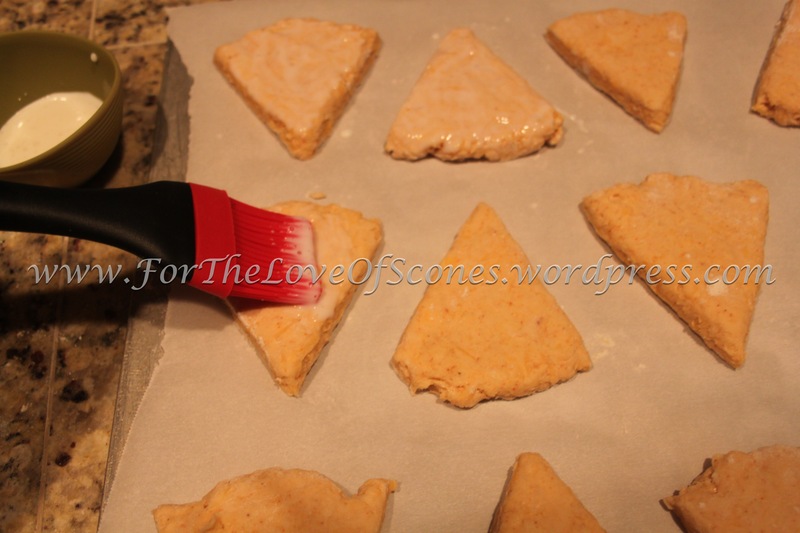 6) Turn out onto a floured countertop and split dough into two equal pieces. Knead each piece a few times to bring the dough together. Flatten each into a circle about 6- to 8-inches in diameter. Cut each round into sixths. 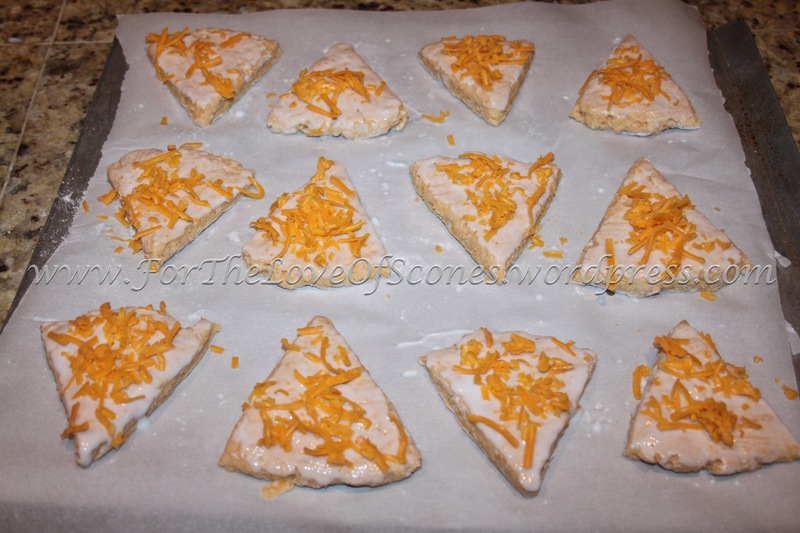 7) Place on a parchment-lined baking sheet about an inch or two apart from each other. Brush with buttermilk (or milk) and sprinkle with cheddar (or Parmesan) cheese. 8) Bake at 400°F for 12-15 minutes until light golden and the cheese starts to crisp on top. 9) Remove to a towel-lined cooling rack and place a second towel over top. Allow to cool completely for best flavor. 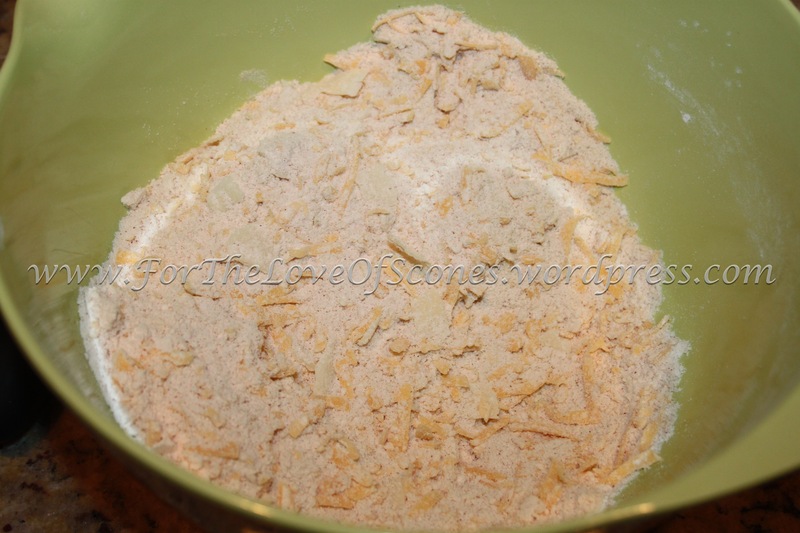 Add the butter and work in until it resembles fine granules. 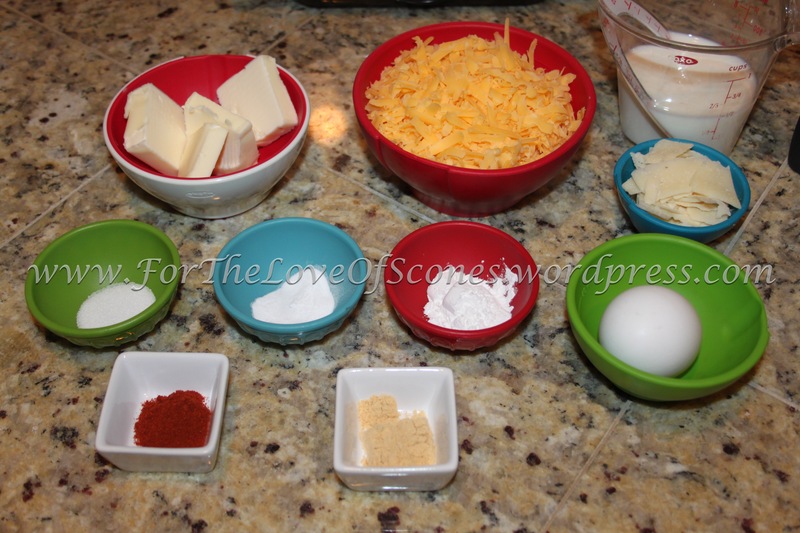 Add the cheeses to the dry ingredients. 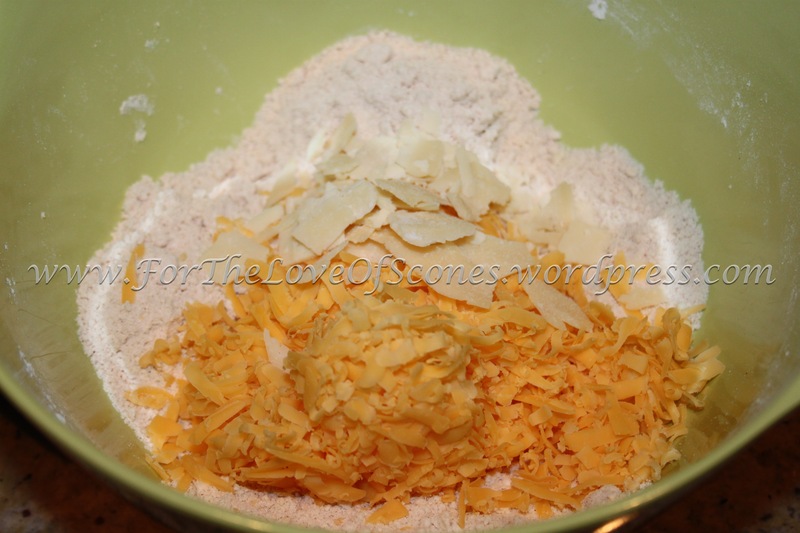 Stir the cheese in with a wooden spoon, breaking up any clumps. Mix the milk and egg with a fork. Stir with a wooden spoon until mixed. 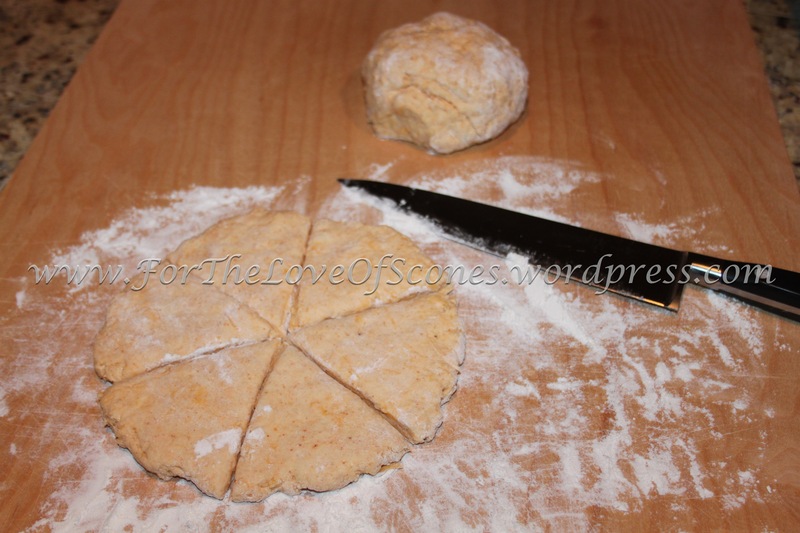 Split the dough in half when you turn it out onto a floured countertop. 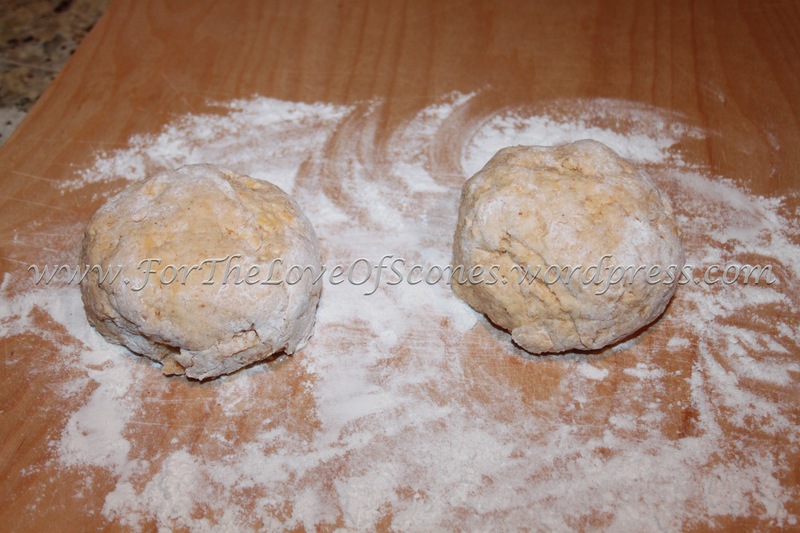 Give each half a few kneads until the dough is smooth. Flatten each half into a round and cut into six triangles. Brush with buttermilk (or milk). Sprinkle with a pinch of cheese. Remove from oven to a towel-lined cooling rack. 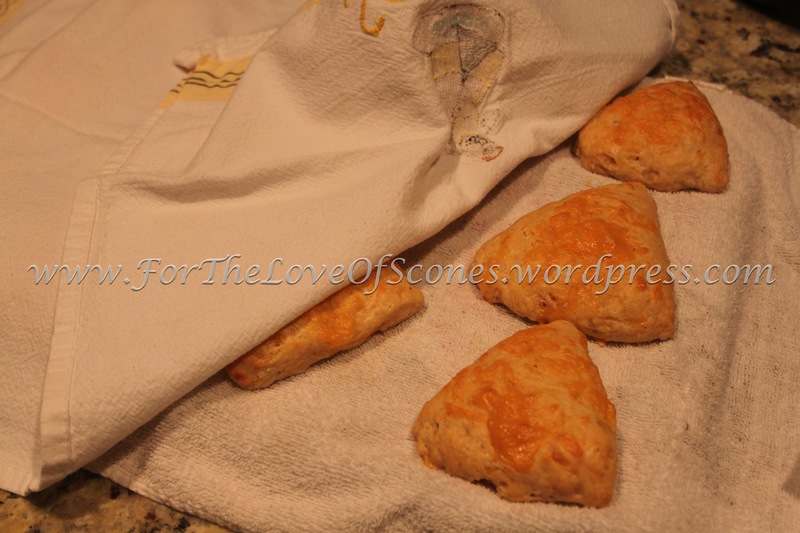 To cool these scones, place on a towel-lined wire rack and cover with a second towel. I think they would have been much better with a very sharp cheddar instead of medium cheddar (I used Tillamook), and perhaps with more Parmesan. I’ve made recipes very similar to this in the past, and I much preferred those in taste. Regardless, these would accompany a large bowl of chili well, or even a salad.